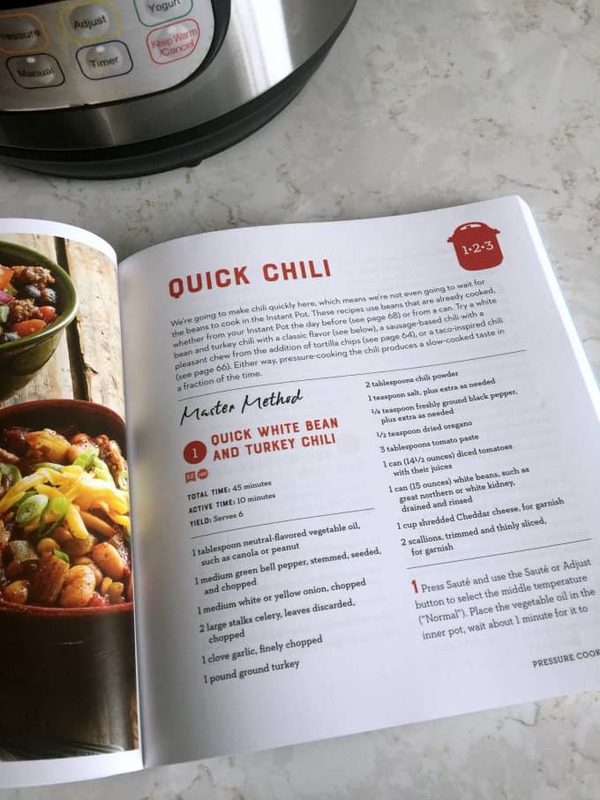 This White Bean Turkey Chili made in the Instant Pot is easy to make and so delicious! Everyone is talking about the Instant Pot! It’s a hot item this holiday season. Many of my friends on Facebook posted that they picked one up on Black Friday. I already owned one – I bought it last year. However, I haven’t used it as much as I would have liked. I think it’s because it intimidated me. I mean, this kitchen appliance, can do SO MUCH. It’s a pressure cooker, slow cooker, yogurt maker, rice cooker and more. Disclosure: Our sponsor Workman Publishing introduced us to an exciting new Instant Pot cookbook. All opinions on this blog are my own. 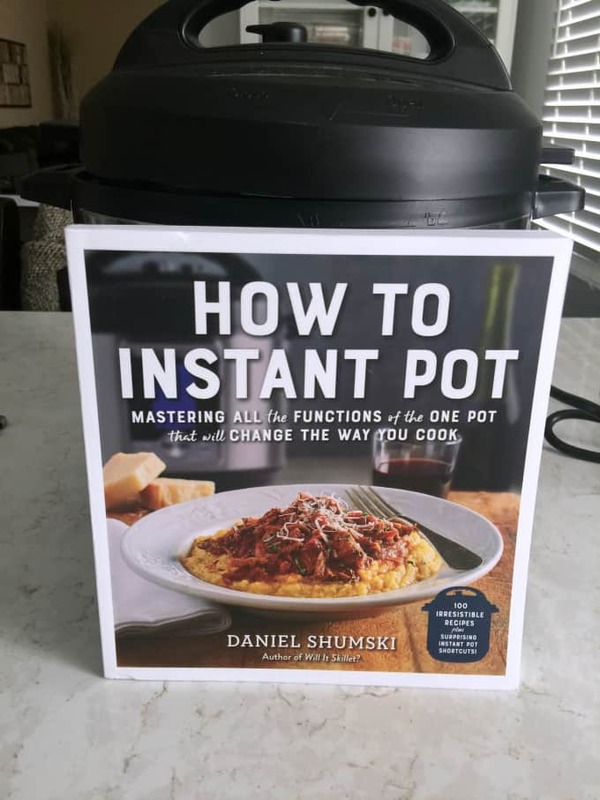 I recently received a copy of the cookbook, How to Instant Pot by Daniel Shumski. It’s newly released and has been in stores since October 31, 2017. This cookbook was exactly what I needed to give me the confidence to start using my Instant Pot again. Not only does it feature over 100 delicious one-pot recipes, but it also teaches you how to use the Instant Pot. It’s the only Instant Pot cookbook organized by function and also shows you what all those buttons on the Instant Pot do. Once you master the Instant Pot, it will change the way you cook. I loved the wide variety of recipes and I can easily see many becoming family favourites. 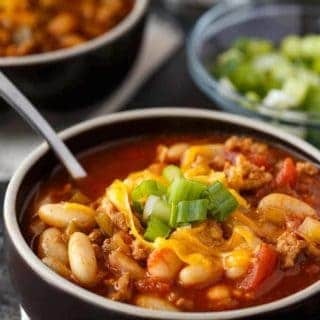 I selected a Quick Chili recipe to try using the Pressure Cooker function. 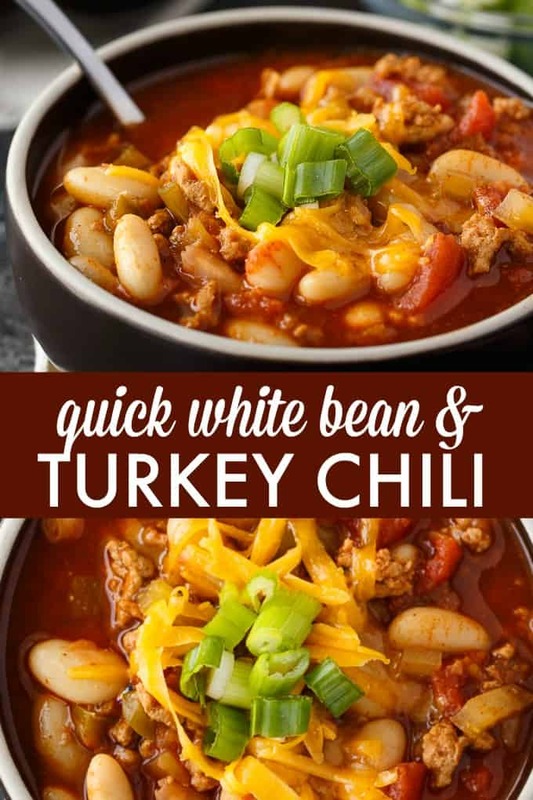 Quick White Bean and Turkey Chili appealed to me because it had simple ingredients. I also wanted to get more practice using the Pressure Cooker function on the Instant Pot. Many of the ingredients I had on hand in my pantry already. I only had to pick up the veggies and ground turkey on my trip to the grocery store. When they say that it’s a one-pot meal, they mean it. Each step of the recipe is done in the Instant Pot including sautéing the veggies and turkey. I love that feature of the Instant Pot because it means less dishes for me to clean up afterwards. I’m notorious for making a mess in the kitchen when I’m cooking. I appreciated that the recipe instructions were very detailed so I knew exactly what buttons to press and when during the process. They broke it down step-by-step making the recipe easy to follow. I also liked that they mentioned the safety instructions like using a wooden spoon to move the pressure-release valve to venting. It’s super HOT! This chili recipe took about 45 minutes to make from start to finish. 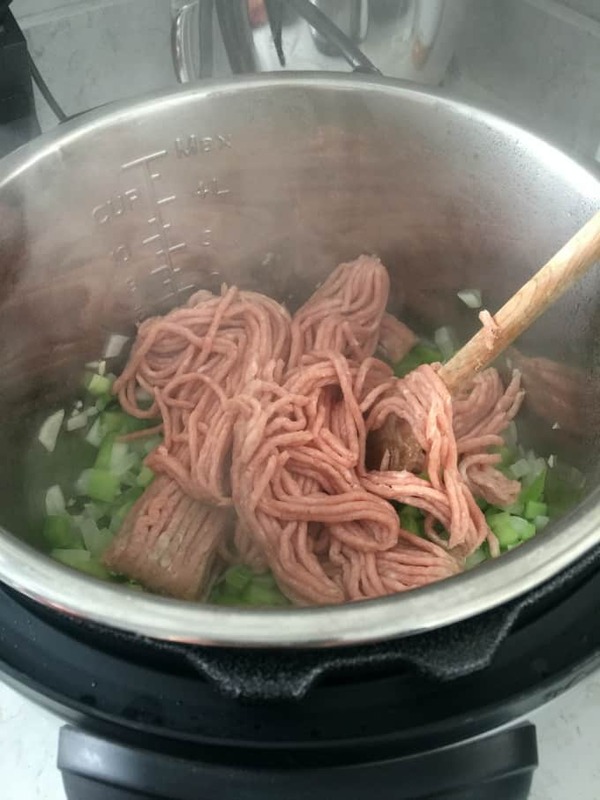 It cooked for 20 minutes in the Instant Pot as a pressure cooker. I couldn’t believe how yummy it tasted! It had the same deep flavour as a pot of chili that had been simmering on the stove all day. This recipe makes six servings and my family gobbled it up in record time. Even my picky 13-year-old daughter ate her entire bowl. I was shocked! I’m leaving my Instant Pot on the kitchen counter because I plan to use it several times a week. The How to Instant Pot cookbook will also be close by as I’m going to be trying the other recipes. You might also like these Slow Cooker Black Beans. Check out this Instant Pot Guide or Instant Pot gifts. 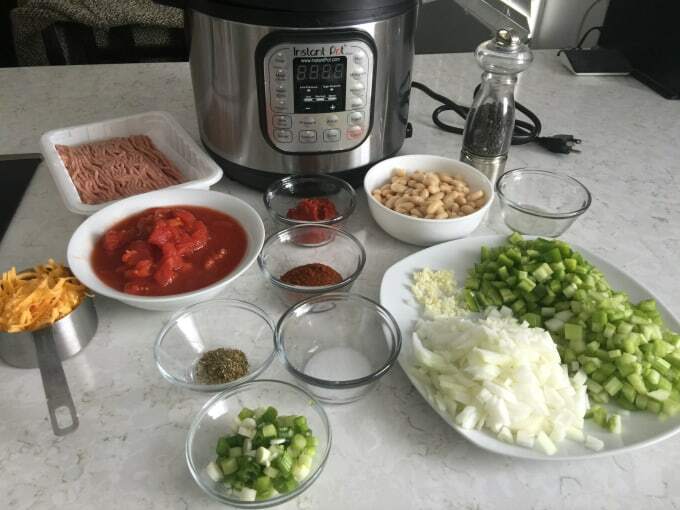 Connect with How to Instant Pot on Twitter, Instagram and Facebook. Connect with Workman Publishing on Twitter, Instagram and Facebook. 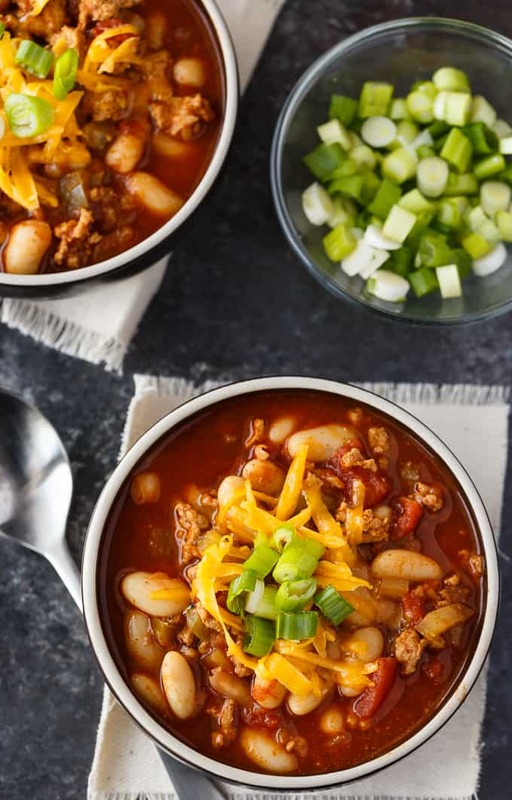 This Instant Pot chili is easy to make and so delicious! Press Sauté and use the Sauté or Adjust button to select the middle temperature (“Normal”). 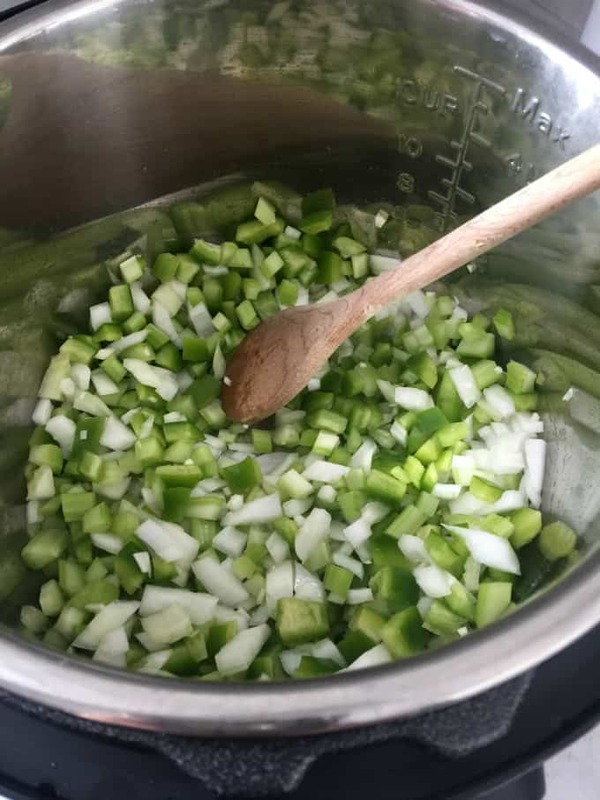 Place the vegetable oil in the inner pot, wait about 1 minute for it to warm, then add the bell pepper, onion, celery and garlic. Cook with the lid off, stirring occasionally to break up, until the onions soften slightly, about 5 minutes. Add the turkey and use a wooden spoon or silicone spatula to break it up into small pieces as it cooks. Cook the turkey until it is no longer pink, about 5 minutes. Add the chili powder, salt, pepper, oregano, tomato paste, and diced tomatoes with their juices and stir until everything is evenly mixed. Close and lock the lid. Set the valve to Sealing. Press Cancel, then press Manual or Pressure Cook and use the Pressure or Pressure Level button to select High Pressure. Use the – or + button to set the time to 20 minutes. Press Cancel and remove the lid. Add the beans, stirring to distribute them evenly, then close and lock the lid to allow the residual heat to warm the beans, about 5 minutes. Taste and adjust the seasoning, adding more salt and pepper as needed. Serve the chili hot, garnished with the shredded Cheddar and scallions. Quick White Bean and Turkey Chili will keep, in an airtight container in the refrigerator, for up to 4 days. To reheat, place it in a pot and warm on the stovetop over medium heat, stirring occasionally, until hot, about 5 minutes. 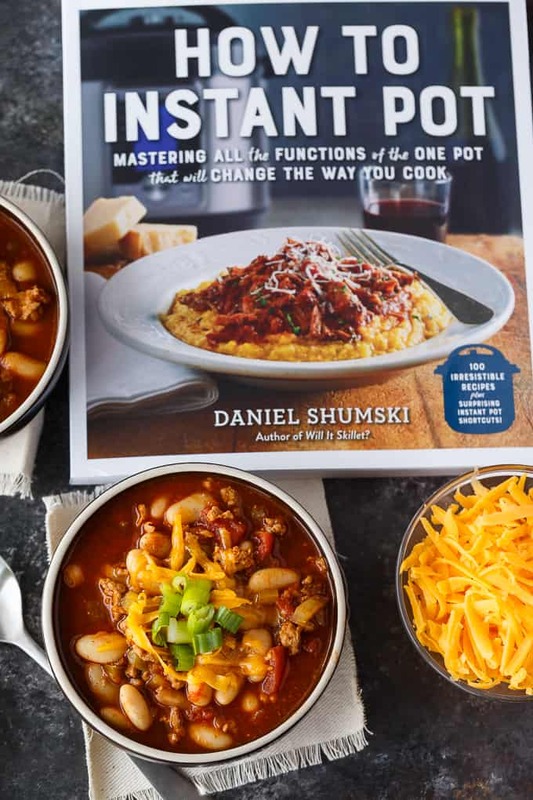 Excerpted from How to Instant Pot by Daniel Shumski (Workman Publishing). Copyright (c) 2017. Photographs by Ken Carlson. I need an instant pot ASAP! I don’t have an Instant Pot but I bought one for my dad for father’s day and he loves it! My parents live one block away, and have said we can borrow it any time – I just haven’t had a chance yet. They go away for 2-3 months every year, so as soon as they go I will be borrowing it for the duration. Anyway, I would love to win this book to gift to my parents (and to borrow from them when I also borrow the pot itself!). No .But I would to have one. Then I could make this yummy sounding recipe. I just got one but I want my son to have one. He goes to Sacramento State Univ. I could have used one today for my chili. Thanks. this is something I do not have, yet. I would love to win one of these. Seems easy to use. 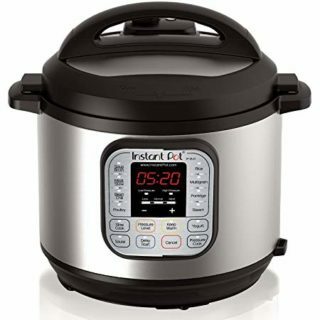 I don’t have an instant pot yet, but have been thinking about getting one! 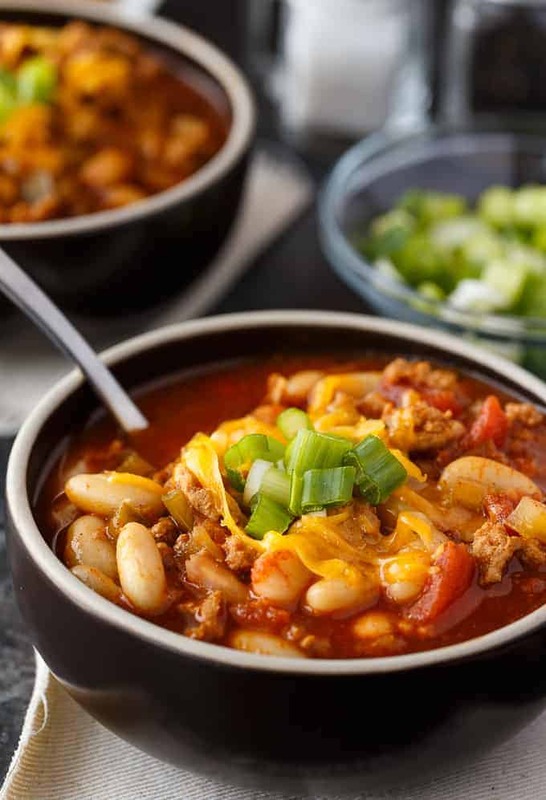 This chili looks very tasty, I would love to try it when I get an instant pot! No I don’t have one. I don’t have an insta pot. 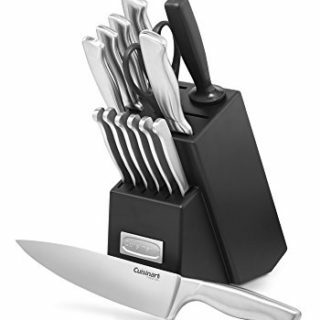 I would love to get this and learn to cook with thre insta pot. No I don’t have one, but it’s on my wish list. No I don’t have an instant Pot! I don’t have an instant pot yet, but I sure would like one. No but I would love to own one. I do not have an instant pot, I am hoping Santa leaves me one under the tree! I do not. Seems I’m one of only a few by now. no, that’s on my bucket list! This looks like a great recipe for the instant pot! Hope you have a great week and thanks so much for sharing with us at Full Plate Thursday. I don’t have an Instant Pot yet, but it’s on my wishlist for Christmas. I have had one since summer so this would be great! I don’t have one yet but a bunch of friends have just gotten them and love them! No, but I would love to have one in my kitchen. I have heard nothing but amazing things about them. No. I don’t even know anyone that has one. I love using a pressure cooker. I don’t have an Instant pot but maybe Santa will bring me one !! No I don’t but I’m hoping to for Christmas. I do not have one yet but I really want one ! I don’t. To tell the truth, I’ve been wanting to try one, but I’m a little afraid of pressure cookers. My grandmother had horror stories about exploding cookers and, even though I know the ones today are safe, I’m still a bit scared. 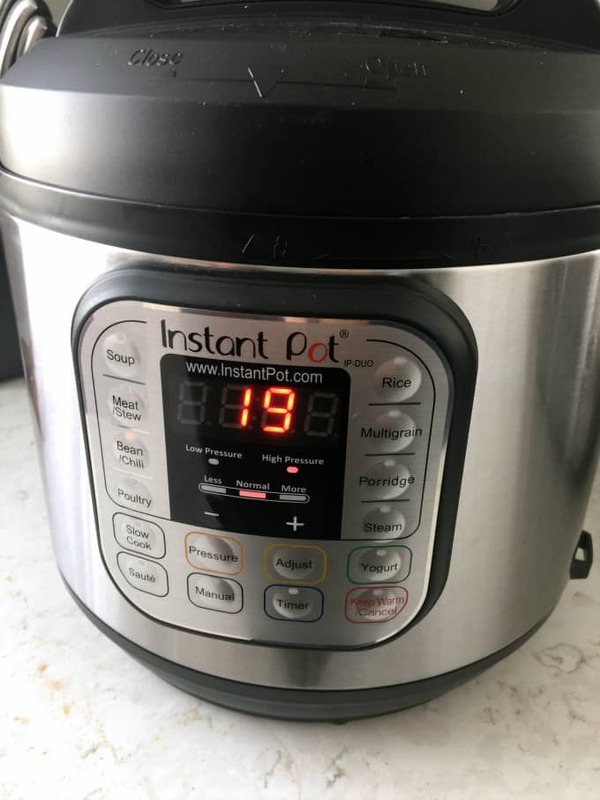 No, I don’t have an Instant Pot, but I can see how one could be a dinner time time-saver! No, but I’m interested in learning more about them. Yes & I love it. 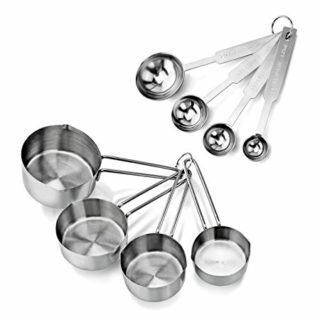 So easy to use and I love finding new recipes to make with it. i don’t have an instant pot yet but i hope to get one this year for Christmas. Yes but I’m not very confident with using it. It’s hard to find recipes or good instructions.